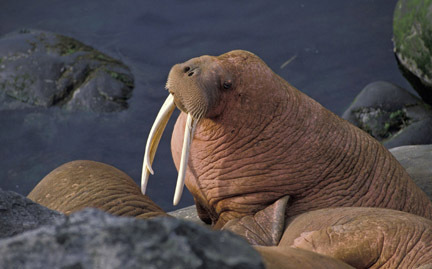 Surviving on a diet of fish, walruses inhabit the Arctic regions of the Pacific and Atlantic Oceans. Their great white tusks are smaller than elephants, but still impressive, and are used as ice-choppers, sediment rakes, weapons and status symbols. Walruses are excellent swimmers capable of diving to depths of 300 feet. Once hunted commercially for their ivory tusks, walrus hunting is now restricted by law. In spite of legal protection, walruses remain at risk from poaching, toxins and pollution.